If you go to Danshui, of course you have to try this. You can find it everywhere in the night market, and that’s really delicious. Don’t focus on the weird appareance. 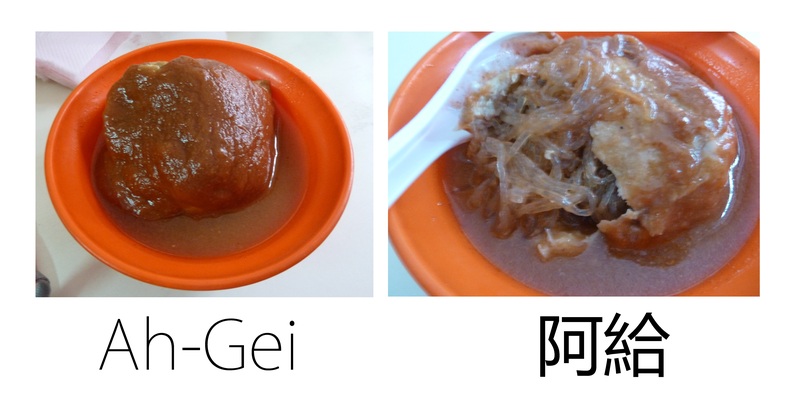 Ah-Gei is Tofu filled with crystal noodles (the vermicelli noodles) and the whole is put in a spicy sauce. On night markets, you find them without the spicy sauce so at first i didn’t recognize the dish. It’s quite hard to eat, because you first need to pierce/open the tofu (and with chopsticks that’s not the easiest thing on Earth) and then to mix the sauce with tofu and noodles to eat. But that’s really worth it.